Since Amazon began allowing customers to post reviews on product pages, various waves of bogus reviewers have attempted to game the system by posting fictitious or dishonest write-ups. While Amazon has recently taken legal action against people paid to write fake reviews for products, and the site has a ban on most forms of “paid” reviews, there’s a new crop of compensated reviewers who are receiving free or discounted products in exchange for then writing “honest” reviews. But some of these users are writing dozens of reviews a day, sometimes for products they couldn’t possibly have tried. This newer form of fake, paid Amazon reviews are creeping in thanks to marketing sites that offer free and deeply discounted items if buyers promise to then share their honest feelings on Amazon. • Third-party marketers are selling products, or giving them away, in exchange for “honest” Amazon reviews. • Amazon allows such reviews, so long as the compensation is clearly disclosed in the review and the writeup is truthful. • Some people who receive free/discounted items are posting reviews for products they could not possibly have tried. • They are also posting dozens of reviews daily, upwards of hundreds of reviews a month (almost all 5-star reviews), without being flagged by Amazon. • Ignore star ratings and read the full text of reviews to get an idea if the reviewer (A) actually tried the product, and (B) has similar standards to yours. • Amazon users can filter reviews so that only “verified” purchases show up. This will also filter out people who bought items through Amazon at a deeply discounted price. • Use sites like FakeSpot.com to scan through reviews to help determine whether or not the content may be useful to you. While Amazon’s review guidelines prohibit most “paid” reviews, they do include an explicit exception “when a free or discounted copy of a physical product is provided to a customer up front” if the user “clearly and conspicuously disclose[s] that fact” in their review. That’s because e-tail giant has its own form of a “free stuff for reviews” in Amazon Vine, which allows select customers to get pre-release access to some products. But Amazon knows who Vine members are and what they’ve received through the program. Amazon does not, however, necessarily know if a reviewer purchased an item through some discount marketer with the promise of writing a review. But it’s those very statements that are giving regular Amazon customers an indication of just how bad this problem can be. Case in point — no pun intended — Consumerist readers directed us to the Amazon page for this phone case for the Lumia 650 smartphone. When we began researching this story, there were 10 reviews posted on this page, many of them mentioning how well the phone fits on their Lumia 650: “It fits snuggly and provides good protection,” reads one review. “it is great fit my phone great,” opines another user. All of the reviews indicated in some fashion that they had received the case for free or at a discount, and all but one of the reviews was a five-star writeup, potentially leading a shopper to possibly believe that this is a decent product. Except there aren’t yet any shoppers looking for this case, because the Lumia 650 hadn’t been released when these reviews were written. Perhaps it’s possible that all 10 of these reviewers managed to get an early release of the device? Three of the reviewers involved also posted their email addresses on their profiles, so we wrote them to ask, but have yet to hear back from any of them. Out of curiosity, we looked at what else these users had reviewed, and every single one of them with a public profile appears to have spent an inordinate amount of time writing up their supposedly honest feelings about dozens of products — a day. We looked at the list of reviews since Jan. 1 for each of these users and found that they averaged more than 400 reviews each in just those few weeks. The fewest was around 100 reviews since Jan. 1, while one user managed to somehow crank out approximately 950 reviews in a single month. Assuming eight hours of sleep per day, that’s nearly two reviews an hour for every single waking hour, every day of the week for 31 days. So what are these people reviewing? Apparently anything they can get at a deep discount in exchange for a review. In just a few hours, one reviewer posted her thoughts on a USB travel charger, melatonin pills, two USB cords, novelty wine glasses, a selfie stick, a bunion splint, and phone cases — lots of phone cases. Galaxy Note 4; Galaxy E7; iPhone 6S; iPhone 6S Plus; iPhone 5C; Galaxy S6; Galaxy S7 Plus (a device that doesn’t even exist); Galaxy Grand Prime; Galaxy Centura; HTC One A9; LG V10; Galaxy S5; ZTE Grand X Max; Galaxy Alpha; Lumia 950; Moto X; Lumia 550; Lumia 850; Lumia 650; ZTE Allstar; Huawei Union; Galaxy Avant; Droid Turbo 2; Galaxy S6 Edge; Nexus 6P; LG Optimus F6; OnePlus One; Alcatel OneTouch Idol 3… and that’s when we just gave up taking notes. By the way, all these reviews — 5 stars. In fact, we had to scroll past approximately 650 reviews to Jan. 10 before we got to one from this user that was not a 5 star writeup. Yes, it is possible (inasmuch as virtually anything is possible in an infinite universe) that there is someone out there legitimately purchasing hundreds of items a month — many of them redundant, based on previous purchases — then taking the time to write glowing reviews for each of those items. But in the real world of limited possibility, all of the above signs point to many of these reviewers being blatant fakes — or at least meriting further scrutiny from Amazon. So why are these reviews allowed to be posted? Shouldn’t the very fact that someone received something for free call into question that person’s ability to provide an unbiased point of view? At the very least, that reviewer can’t be fully relied upon to tell other shoppers whether something is worth the real price of the product. Then again, if someone receives an item as a birthday gift, they aren’t expected to disclose that in a review. And almost all publications that review products — from cars, to appliances, to books, music, movies, and video games — get these items without spending a dime. But the difference is that no one gets a birthday gift on the condition that they then review it. And while professional reviewers have been known to be cut off from free products by companies that feel they were treated unfairly, pros who routinely rave about everything they try rarely carry much authority with readers. Given the obvious red flags shown in the examples above — too many reviews, too many raves, use of easily identifiable language showing that these products were discounted in exchange for reviews — you’d think that Amazon would be able to filter out these users’ feedback, much in the way that Yelp’s algorithm automatically hides reviews it deems questionable; those writeups are still available for reading, but they aren’t included in the star ratings and aren’t shown unless the reader deliberately unhides them. 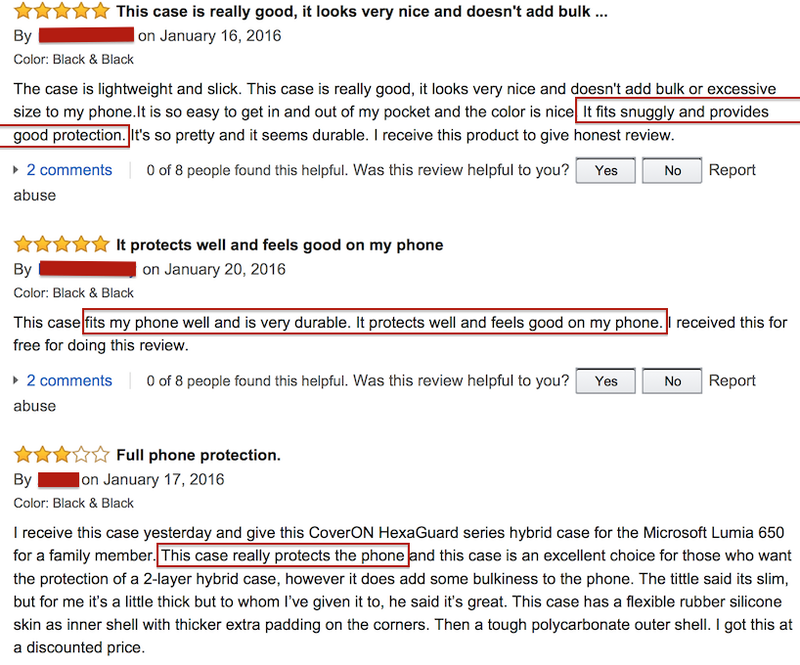 After we brought the questionable reviews for Lumia 650 case to Amazon’s attention, some of the reviews were taken down. As of now, only one of the ten reviews from compensated users remains. Interestingly, it’s the only one that did not give the case five stars. Is Amazon actually doing anything proactive to prevent the spread of these dubious reviews? Aside from pointing to the recent legal actions taken against allegedly fake reviewers, the company would not provide any information on any efforts to track and/or filter users with questionable motives, though a source at the company did say it is aware of the problem and how the presence of apparently fake reviews hurts real customers and Amazon’s image. First off, as we’ve advised on all crowdsourced review sites, ignore the star rating, not just the average rating for a product but for each individual review. What is a 3-star product for one person might be a 5-star product for another. Sometimes people knock off stars for reasons you wouldn’t even consider, like the color of a DVD player’s remote control, or because they simply don’t like the company that makes a product. Read the actual text of the review and decide for yourself if it’s of any relevance to your needs. Filter reviews so that you’re only seeing “verified purchases” from Amazon customers. Yes, this will remove all the reviewers who legitimately bought a product elsewhere, but at least you’ll know that the reviews you do see are from people who paid for it. Amazon would not say what level of a discount triggers that “verified” threshold, or whether that rule also applies to customers who purchase items directly from Amazon (as opposed to third-party sellers on the site). Combining these three tactics won’t guarantee that you avoid fake reviews, but they will give you a better sense of whether or not the reviews for a product have been overrun by compensated shills. Can Anyone Get In Trouble For This? Aside from diluting real reviews to the point where Amazon customers don’t know who to trust, is anyone really doing anything they could get in trouble for? That depends, according to some lawyers we spoke to. If people are deliberately posting false reviews to hurt a company, that’s certainly something that can, and has been, the subject of legal action. “Fake unfavorable reviews are actionable under product disparagement laws and other causes of action related to defamation,” explains Regina Austin, the William A. Schnader Professor of Law at the University of Pennsylvania. When the fake reviews are negative, it’s usually the manufacturer being slighted that does the suing, says Austin, not the customers who are getting bad information. It’s much more difficult to argue harm from bogus positive reviews. But if a company makes a concerted effort to distort Amazon reviews — either negatively or positively — then that could lead to the involvement of a regulator like the Federal Trade Commission. “There would have to be a pattern of conduct on the part of the advertiser to encourage consumers to post reviews that are overly glowing or not truthful,” explains Dana Rosenfeld, former assistant director of the FTC’s Bureau of Consumer Protection. So who is ultimately liable in such a case? Certainly, the individual reviewers shoulder the blame for writing the actual reviews, but the more likely target of a regulatory complaint would be either the discount marketer or the manufacturer paying that marketer to get their products reviewed. Yes, the discounter requires “honest” reviews and transparent disclosures, but — at least judging by the examples we’ve seen — they are not questioning why some of their customers seem to love everything they review, or how some of these people are posting reviews for items that they couldn’t possibly have used yet. Rosenfeld tells Consumerist there’s nothing inherently wrong with an Amazon page full of glowing reviews — even ones for which reviewers receive some sort of compensation — so long as they accurately reflect the reviewer’s experience, are truthful, and adequately disclose any incentive provided by the advertiser. “The manufacturer has an obligation to monitor what their marketing partner is doing,” explains Rosenfeld.